What a beautiful weekend to be outside… and even better if you were running! Saturday saw the first of the year’s relay action with three SJ teams in action at Alice Holt in the Bolt Round the Holt event which saw teams of two, three and four runners complete 21km. The Sandhurst Joggers team of Graham Robinson, Jenny Robinson, Neil Praine and Stephen Casey finished 1st with Richard McCready, Jane Crawford, Sarah Campbell-Foster and Kerstin Johnson 7th. Special kudos for Angela Foker, Lucy Murphy, Katie Woolger and Claire Chase who finished a great 11th in their first team relay. Great results for all. Clive Rolfe was 2nd V40 and 4th overall in the solo 10k event and Pam Whelan also ran well to complete the 10k distance. The Events team will have more details on the upcoming Summer Relays later in the week so keep a look out and sign up for these great sociable events. Frimley Lodge Parkrun saw a good turnout of twelve SJs with both Georgina King and Philippa Francis recording PBs as their great improvements continue. Mark Pattrick first home for the club in 22:05. Paula Vine was next Jogger to finish as she returns from injury. Another injury beater Harvey Young scored his best time on the Frimley Lodge course. Over at Parkrun Bracknell, ten members tested themselves on the testing course with another rehabed injurist Fiona Slevin-Brown the first Sandhurst Jogger to finish in 27:22. Fiona was followed by John Wright and Royston Crandley who made his first visit since the course changes. A superb result for James Ratcliffe Rushmoor as he finished in second overall with a stunning time of 18:09 just nine seconds shy of his fastest ever and only eight seconds off the win. Nigel Evans and Helen Vizard were the next club finishers out of the five competing. Kevin Forster took the Parkrun tourism to Dungloe, Ireland running to within 20 seconds of his best time ever (recorded locally at Frimley Lodge). Lisa Hale returned to Basingstoke with her fastest at the venue recording 21:05 and Patrick Wadsworth sampled the Richmond Parkrun. At the Cranleigh 15/21 Helen Antram was first home for the club in the 21 mile event in an impressive time of 2:40:28 with Lisa Hale finishing less than two and a half minutes later. 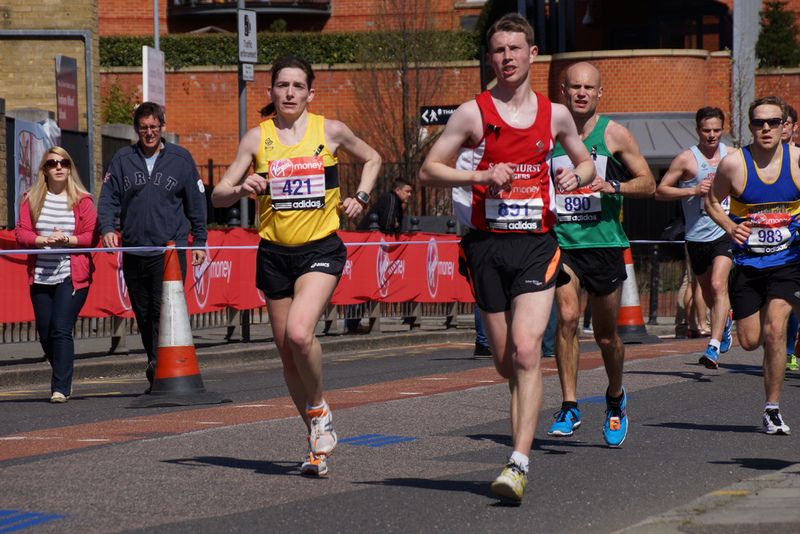 Lynsey Lightfoot also ran strongly to complete the longer distance. Leon Hicks and John King were in action at the Queen Elizabeth Spring Marathon at Queen Elizabeth Country Park with both doing well on the tough course. John finished in 4:44:49 and Leon in 5:55:47 bringing his total to twenty in his 52 in 52 quest! Graham Meek took the top spot on Strava this week as he prepares for a big ultra in May. He ran 90.6km this week! Will Davidson was second with 86.9km and Lisa Hale third with 77.2km. Sixty three members logged runs on Strava this week. To take part in this just create a free Strava account and link it to the club in your profile. The membership renewal system is open so if you haven’t already you can sort your club membership for the next twelve months and take advantage of what one member called ‘the bargain of the century’. As always keep a look out on Facebook for details of the weekday evening runs. Monday: A mystery guest leader will be leading the usual Monday night chatfest leaving Sandhurst Sports Centre at 7:30pm. Tuesday: Multiple groups running on Tuesday from Sandhurst Memorial Park this week plus the interval session meeting at The Tythings in Yateley at 8pm will be Dave’s Mum’s House: 14 x 2 minute efforts with 30 second recovery after each. Thursday: This week the threshold/improvers run will be on the much loved Crawley Ridge route, don’t forget your headtorch and high viz as it’s still dark out there.